A Collision Advice webinar earlier this fall demonstrated that fixing a Volkswagen can mean paying attention to some very important times related to adhesives within the erWin repair procedures. Citing U.S. repair procedures for installing a roof on a 2015 Jetta, Collision Advice CEO Mike Anderson showed how the part requires a specific structural adhesive from a Volkswagen dealership. (The original Jetta roof appeared to have been laser-welded at the factory, based on the procedures.) However, Anderson also pointed out a VW instruction on how long that glue needs to cure. Not only must the vehicle “stand on a level surface,” it must be allowed to cure at “room temperature (at least 15 °C (60 °F)) for eight to 10 hours so the adhesive components can cure,” according to the VW repair procedures featured in the September webinar. Anderson said he couldn’t tell the audience how often he visits a shop and sees a Volkswagen sent to the paint department just two hours after adhesive. This also suggests that the repair itself must be done wherever the vehicle is going to sit for those 8-10 hours, since the instructions indicate you can’t move it once the roof is glued to the car. Anderson demonstrated a similar shop misunderstanding in discussing how a different structural adhesive must cure. Some people suggest just sticking the vehicle in the paint booth and baking it at 176 degrees, according to Anderson — but there’s a flaw in this logic. “You can’t move that vehicle until it’s cured,” Anderson said. The shop would have had to done the “entire repair” within the paint booth for that idea to work, he said. In other instances, a material might cure quickly, and the shop will have a limited window of repairability if it uses the adhesives, Anderson said. In a similar vein, we noticed another Volkswagen passage visible during the show warns against picking up an particular adhesive applicator and using it after a break. 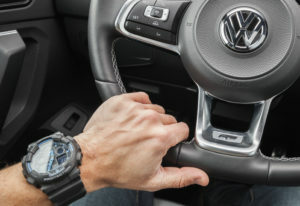 The shop also must press out 5 cm worth of that adhesive before using it the first time, Volkswagen said. An substance demanded by Volkswagen might also have a limited shelf life, according to Anderson. He advised shops to check VW-specific items for an expiration date, for VW will include them on packaging like cartridges or cans. A material left sitting too long on a shelf might have expired by the time a shop needs it, he said. A final interesting bit of trivia about time mentioned in the report came from Anderson’s discussion of VW mounting requirements. He said he couldn’t tell the audience how many shops tie down a Volkswagen and anchor it by the pinchwelds. “That is absolutely an inaccurate repair,” he said. A paragraph on the show related to bench-type or hydraulic straightening systems states that high-strength steels “must be stretched more than a normal panel” to stay where you want it. “Due to the higher application of force, normal panels that are welded with high-strength panels are strained more. In order to prevent normal panels from yielding or tearing, an additional anchorage must be provided, Volkswagen wrote. He said a shop should take a 2.0-hour set up and measure metric and “throw that out the window,” for anchoring in four to six locations might be necessary.